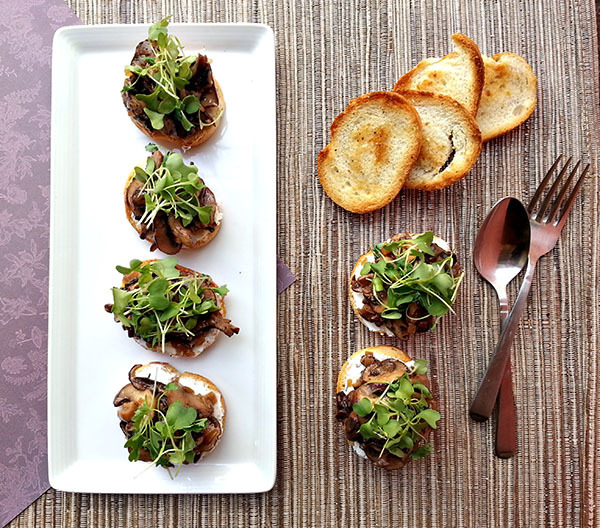 Last week I dedicated my blog to showcasing 3 hors-d’oeuvres for the holidays. Just when I thought I was done with appetizers, I realized that I had the ingredients to make an impromptu one. 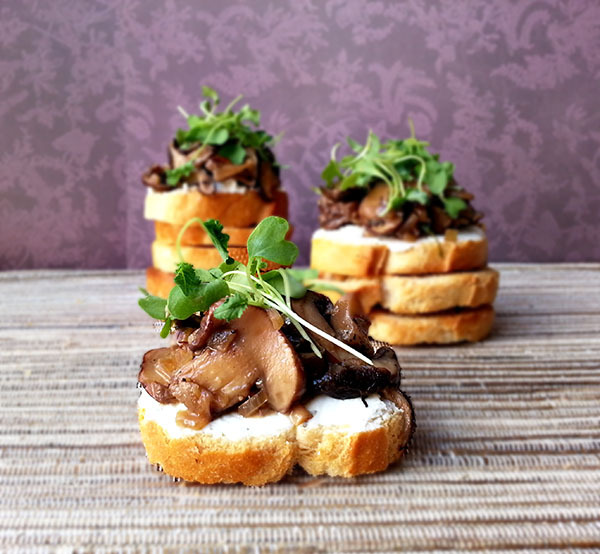 Next thing I know, I’m whipping up a batch of one of my favorite appetizers, wild mushroom bruschetta on crostini with whipped goat cheese. This is a great substitute for the classic bruschetta when tomatoes are not in season. 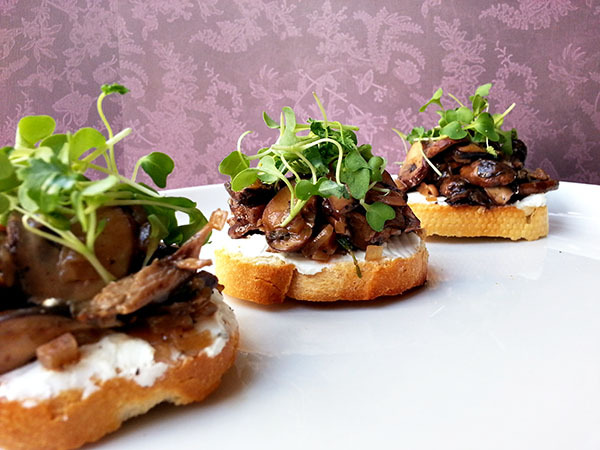 The wild mushrooms paired with creamy, whipped goat cheese on a crusty slice of baguette is a match made in heaven! Toss sliced baguette with olive oil, salt, and pepper. Spread on a baking sheet and bake for 5-7 minutes or until golden brown. Turn crostini over and toast for an additional 3 minutes or until both sides are golden brown. Let cool. Set aside. 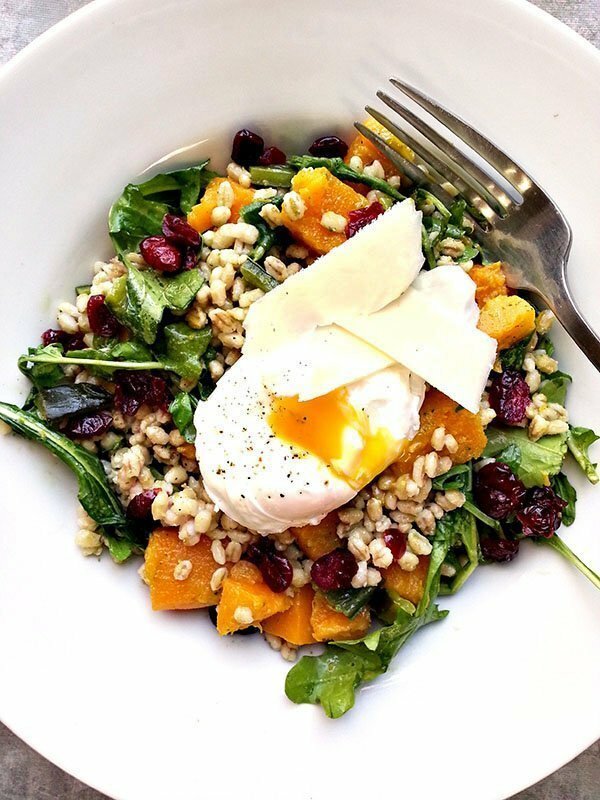 Combine goat cheese, cream cheese and heavy cream in a medium bowl. Whip with mixer until softened and cheeses are combined, about 3-4 minutes. Set aside. Heat 1 tsp oil in nonstick saute pan over medium heat. Add sliced mushrooms and thyme; cook until browned, about 6-7 minutes, stirring frequently. Deglaze the pan with sherry and cook until liquid is almost all evaporated. Season with salt and pepper. Remove from heat. Spread goat cheese spread on the toasted crostini. 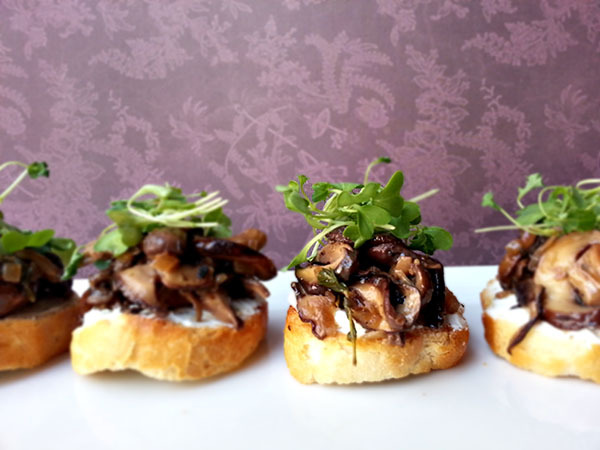 Top with sauteed mushrooms and garnish with micro green or minced parsley. Serve. Bruschetta is one of the most popular appetizers and rightly so. The simple yet beautiful blend of flavors from fresh tomatoes, basil, garlic, olive oil and balsamic vinegar with a lightly toasted crostini just works. Unfortunately, tomatoes are not in season year-round. The solution? 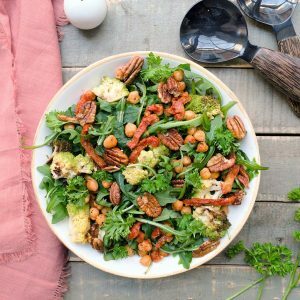 Substitute with wild mushrooms! Oyster, shiitake, chanterelle, lobster, maitake and porcini mushrooms would all work with this hors d’oeuvre; you can even have a mixture of mushrooms for an exotic range of umami. When sauteing the mushrooms, make sure not to crowd the pan. You want the mushrooms to brown nicely and overcrowding the pan will cause them to steam rather than sear. Deglaze the pan with sherry to add a slightly nutty flavor to the bruschetta. You can also use red wine vinegar which adds a more tart note but still tastes delicious. When I first prepared this bruschetta, I originally planned on just using goat cheese. While preparing the appetizer, I realized that the cheese was a little difficult to spread and wanted it to be lighter. Combining it with cream cheese and whipping the mixture lightened up the spread while making it easier to apply on the crostini. Serve the bruschetta cold, at room temperature or hot. 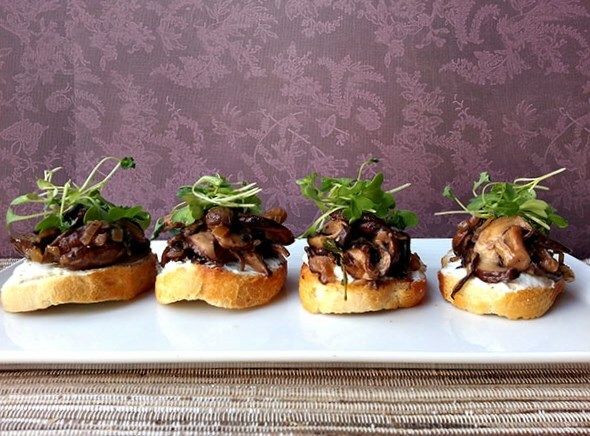 The umami flavor of the mushrooms with a hint of thyme topped on a light, slightly tart goat cheese spread on a perfectly toasted baguette slice is just divine. It’s hard to stop with one serving, especially because they taste guilt-free! If you have leftover mushrooms, use them as a pizza topping or for a brisket sandwich which I will post in a couple days! 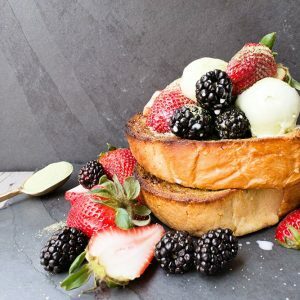 Mmm this sounds amazing! 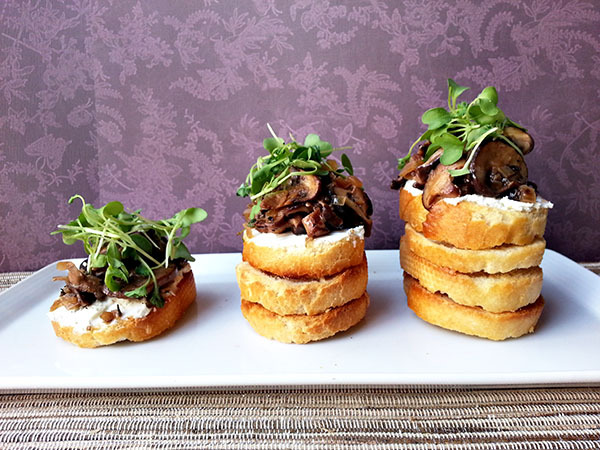 I love bruschetta, and mushrooms are amazing. Together? Perfect! Thank you! Just had these last night and I want more. I'm drooling.